Molecular Mechanisms of Osmotic Stress Recovery in Extremophile Plants: What Can We Learn from Proteomics? During their life cycle, plants are often exposed to phases of high salinity and dehydration stress. Extremophile plants have evolved mechanisms of stress tolerance allowing them to survive or recover from extremely adverse conditions such as water deficit stress and soil salinity. Plant adaptability environmental constraints are linked with deep modifications in proteomic profile, with relevance in abiotic tolerance. Research in extreme drought and high salinity tolerance in resurrection plants and halophytes, respectively, provided some insights into stress tolerance and stress recovery through dynamic changes in protein abundance. Identified proteins under drought and salinity conditions cover a wide range of biological functions: photosynthesis, energy metabolism, protein synthesis, protein folding and degradation and defence response. 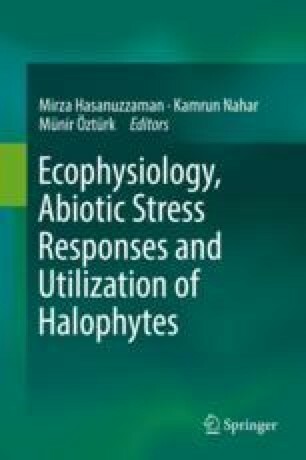 Proteins related to antioxidant metabolism and scavenging of oxygen radicals were found with higher abundance in halophytes and resurrection plants enabling them to cope with stressful conditions. Comprehensive data from recent proteomics studies confirming the relationship between stress tolerance and specific protein abundance are summarized in this paper.